The baby sweater is knit. I almost ran out of yarn. Why this is, I don't know. I've knit it 3 times. The first time I had enough to make a hat. The second time, I had a good amount left over. This time I don't have enough to seam the sleeves with. I know that skein yardage is not accurate, but really! Luckily I do have enough of a solid yarn for seaming. The stealth shawl is moving along. The deadline got moved up last week. The Yarn Co. owner wants it for a show that starts March 26. It needs a bath and blocking before delivery. 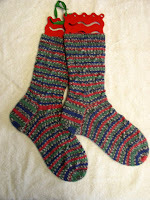 I was on pace to finish knitting March 28 for a show April 4. I have upped my pace. I'm feeling the pressure and I don't like it. My real problem is to write the pattern. I need hexagon pictures. I may have to draw them on paper and scan them into the pattern. So far I have knit 56 of 153 motifs needed. I finished the socks for DGD and mailed them off. Pictures were taken. The pattern was poorly written, but I liked the look, so stuck with it. 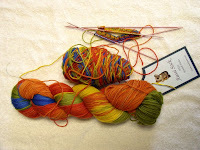 Grumbles are documented on Ravelry, so others can benefit. Another pair of socks is started, intended for my sister. I'm doing entrelac, which I enjoy. The entrelac really shows off this yarn. I've joined facebook at the urging of quilter daughter. It looks like fun, but I don't know how much time I will sink into it. It looks like it could be dangerous. Yesterday was family day. We started by haveing breakfast with DD#4 and her family. We were invited to their house and had waffles and sausage. It's a real chance to spend time with them. Later that day we had a mass gathering/farewell meal to send off one of the older grandsons to National Guard Boot Camp. I hope he finds himself there. He's been floating for almost 2 years since high school. He tried college, but dropped out. He's had a few jobs, but needs some skills. We wish him luck!